Data Center Liquid Cooling Market size is set to exceed USD 2.5 billion by 2025; according to a new research report by Global Market Insights, Inc. 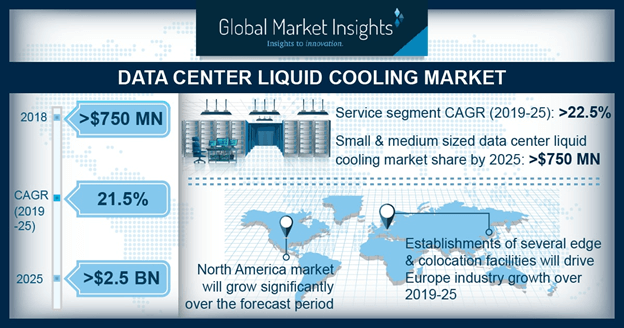 The Europe data center liquid cooling market will grow over the forecast timespan due to establishments of several edge & colocation facilities in various countries. The increase in data capabilities due to digitized processes in various industries such as BFSI, healthcare in European countries is a major industry driver. Additionally, the adoption of AI & machine learning technologies in processes across the European manufacturing sector is also developing the market. Leading players in the data center liquid cooling market include Alfa Laval, Rittal GmbH & Co. Kg, Schneider Electric, Vertiv Co., Chilldyne Inc., Asetek AS, Mitsubishi Electric Corporation, CoolIT Systems Inc., Liquid Cool Solutions, etc. These companies continuously develop new cooling solutions with capabilities to cool highly dense storage components. They also invest in R&D activities to create alternative solutions that further support developments in the market. For instance, in January 2019, nVent Electrical announced the launch of its products including two new liquid cooling systems & PDUs.